BUCHI Labortechnik AG has launched a new extraction line with industry-leading speed, highest application flexibility and smartly designed safety features, which is exclusively available in Southern Africa from Labotec. The newly launched products include a fully automated extraction unit designed for the most challenging extraction tasks in residue and contaminant analysis, natural products research and analysis of polymers and materials. The second instrument is specialised in quick and reliable fat extraction. In combination with the new hydrolysis unit with a sample preparation step for fat extraction, BUCHI can offer a fully compliant solution for the most dependable fat determination in food and feed. The UniversalExtractor E-800 sets new standards for universal extraction tasks in the pharmaceutical, chemical, food and feed industries. The system combines five compliant extraction methods (Soxhlet, Hot extraction, Twisselmann, Soxhlet warm and continuous flow) in one universal glass-assembly. 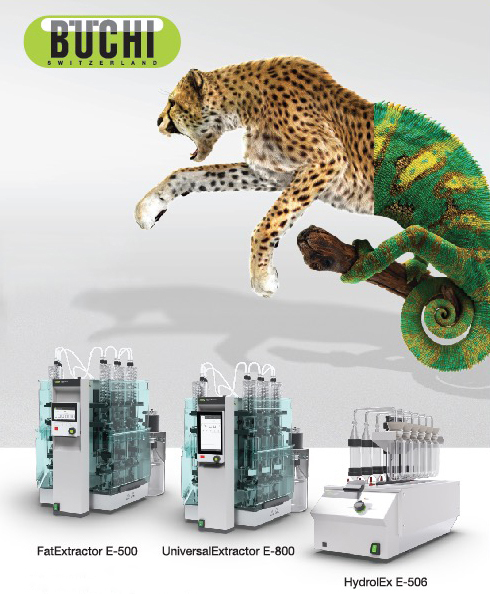 The product enables more multitasking possibilities, faster method development and higher sample throughput. The FatExtractor E-500 is specifically designed for quick and compliant fat determination. The FatExtractor E-500 readily complies with standard methods such as Soxhlet, Hot Extraction (HE) or Twisselmann (ECE). HydrolEx H-506 offers a smooth acid hydrolysis process and perfectly complements the FatExtractor E-500 with easy sample transfer between the two systems. The new extraction units join BUCHI’s existing portfolio for complete proximate analysis with Kjeldahl and NIR solutions. The company’s solutions include innovative products for the entire process workflow, personalized support, easy-to-use data management and professional maintenance. The company aims to satisfy its growing global customer base by continuing to understand specific demands and by designing solutions that fully meet and exceed customers’ high expectations. This entry was posted in News and tagged Buchi Extraction, E-800, FatExtractor E-500, HydrolEx H-506, Universal Extractor.